The following report tries to identify the "Best Possible Date" within a given period (of about 10 days) around the due delivery date, when a child birth should take place through a planned caesarean operation. Once the "Best Possible Date" is identified, thereafter, "Best Possible time slot" (Best Ascendant) on selected date is searched. Out of the 12 houses in Vedic Astrology, 5th house is the ‘Putra Bhava’ i.e. the house of children and thus a very crucial house for a person as far as birth of a child is concerned. It represents overall health and fortune of our children. Considering this, the strength of the mother's 5th house and the influences on it in her birth chart are the major factors in deciding how fortunate the newly born child will be. Similarly, amongst planets, Jupiter is the natural significator of children. Hence condition of Jupiter in mother's chart, on the day of child's birth is also imperative in drawing any conclusion about one’s new born. Planet who is the lord of the fifth house in one's chart is referred to as the 5th lord. It is different for different people based on their ascendants. The lord of a house is as important as the house itself and hence the analysis pertaining to a house is incomplete if its lord is not taken into consideration. 5th lord indicates one's children. Thus, 5th lord’s strength as well as influences on it on the day of child's birth, in mother's chart, are very crucial in reaching any conclusive result about child's well being and fortune. As per the above birth-data, your Vedic (sidereal) ascendant is Cancer ('Kark'), the Vedic Moon sign ('Rashi') is Aries ('Mesh') and Janma-nakshatra (birth-star) is Bharani (pada-3). Please be reminded that do not confuse it with your tropical (Western) ascendant and tropical Moon-sign, which may be same or a sign higher. 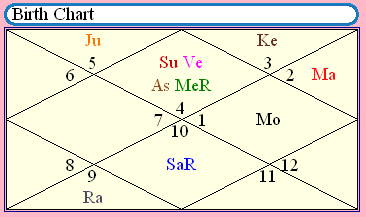 Note: In this chart, 'True positions' of Rahu & Ketu have been considered. It may differ some times from 'Mean positions', which are used by some astrologers and software. . Following astrological graphs have been prepared with the help of "Vjyotish". Vjyotish is a dynamic model for predictions, based on Vedic Astrology principles. The innovative is the 'concept' and 'method' of drawing a net astrological conclusion in precise numerical terms, called as 'net astrological effect', by mathematically quantifying various key astrological parameters. The method is unique in that it quantifies the benefic and malefic influences of each planet, their strengths (Shadbala), their transit through various sensitive points of a natal chart, effects of operating Vimsottari dasa etc. in precise unambiguous figures. It is also unique in that it combines the effects of different planets and houses and can integrate the effects of various planets with respect to each other. By looking at the above three Vjyotish indices, 28th April 2018 comes out as the "Best Possible date" during the given duration for Caesarean of the mother. (-) Ascendant highly afflicted. Ascendant lord in inimical sign. Severe Mangal Dosha. (-) Ascendant highly afflicted. Ascendant lord in 12th house with Mars. Severe Mangal Dosha. (+) Ascendant strong in Sarvaashtak (33 points). Aspected by Jupiter and Ascendant lord Saturn. (+) Ascendant strong in Sarvaashtak (30 points); Ascendant aspected by Mercury & Moon. (+) 5th Lord Sun in Ascendant; Ascendant Lord Mars in 9th House (in Great Friend's sign). Ascendant aspected by Jupiter. 8th House Empty.All four Kendras are occupied by planets. Ascendant unafflicted. (+) Ascendant unafflicted, moderately strong in Sarvaashtak (27 points). (-) Mars & Saturn in 8th. Sun in 12th house. High intensity of Mangal Dosha. (-) Mars & Saturn in 8th. Rahu in 2nd house. Ketu in 8th House. Very High intensity of Mangal Dosha. Ascendant aspected by Saturn & Mars. No benefic aspect on ascendant. (+) Very strong ascendant in Sarvaashtak (36 points). (-) Ascendant highly afflicted. Rahu posited in Ascendant, Ketu aspecting it. Mars also aspecting. No benefic aspect on ascendant. (+) Very strong ascendant in Sarvaashtak (32 points). Ascendant Lord Sun in 9th House. (-) 5th house highly afflicted. Mars and Saturn, both posited there. 8th house not empty (Mercury is posited). (-) Moderately afflicted ascendant. Saturn is aspecting it; 8th house not empty (Sun is posited in 8th). (+) Very strong ascendant in Sarvaashtak (33 points). (-) Ascendant lord Venus posited in 8th house. 3rd and 6th Lord, Jupiter is in Ascendant. I do hope, above analysis helps you in delivering a virtuous child. May Jupiter's Grace shine on your to be born child. In my personal opinion, a child birth should always be through "normal delivery", without interfering in nature's own course. However, sometimes, on medical grounds, caesarian section may become necessary.